Prepare to be scared on this classic Pretzel dark ride, whether that be from the contents inside the haunted house or from the speed of the ride itself! Is this a typo? Is this ride really called Hawnted House? Well, that's what the ride sign says so we'll go with it! 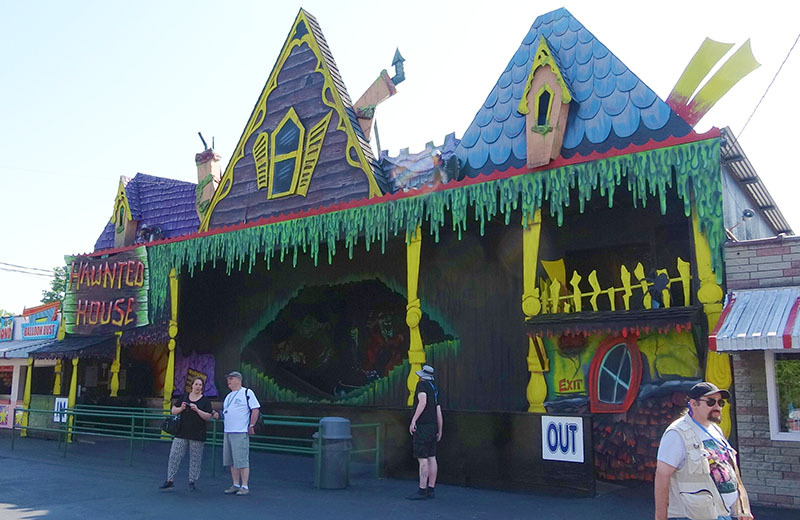 Hawnted House is a classic haunted house dark ride at Camden Park. What makes it special is the ride system, manufactured by the Pretzel Amusement Ride Company. It features small 2 passenger cars which ascend a chain lift hill, a drop, and a series of tight wooden wild mouse coaster style turns. The ride is one of only two examples of a Pretzel dark ride operating in the United States, the other being Devil's Den at Conneaut Lake Park. Hawnted House was refurbished a few years ago, with Chuck Burnham, an artist dubbing himself "The Dark Ride Artist" giving the ride a vibe which mixes classic haunted house props and psychedelic colours. This is by far the best ride at Camden Park, and is well kept. Of everything at Camden, it feels it at least is cared for. Even if they aren't frightened by the horror filled paintings and models inside, riders are likely to be scared with the speed the precariously balanced cars travel around the track. They pick up so much speed, a ride attendant has to use their full body weight to bring the cars to a halt at the end of the ride! Who'd want this kind of birthday?